Citation Information: J Clin Invest. 2016;126(11):4157-4173. https://doi.org/10.1172/JCI87252. Tumor-associated macrophages (TAMs) can influence ovarian cancer growth, migration, and metastasis, but the detailed mechanisms underlying ovarian cancer metastasis remain unclear. Here, we have shown a strong correlation between TAM-associated spheroids and the clinical pathology of ovarian cancer. 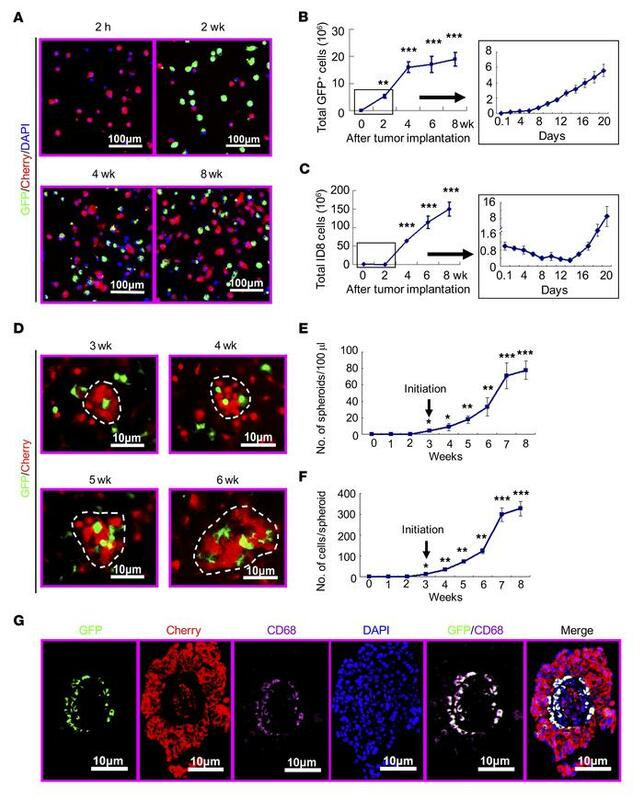 Further, we have determined that TAMs promote spheroid formation and tumor growth at early stages of transcoelomic metastasis in an established mouse model for epithelial ovarian cancer. M2 macrophage–like TAMs were localized in the center of spheroids and secreted EGF, which upregulated αMβ2 integrin on TAMs and ICAM-1 on tumor cells to promote association between tumor cells and TAM. Moreover, EGF secreted by TAMs activated EGFR on tumor cells, which in turn upregulated VEGF/VEGFR signaling in surrounding tumor cells to support tumor cell proliferation and migration. Pharmacological blockade of EGFR or antibody neutralization of ICAM-1 in TAMs blunted spheroid formation and ovarian cancer progression in mouse models. These findings suggest that EGF secreted from TAMs plays a critical role in promoting early transcoelomic metastasis of ovarian cancer. As transcoelomic metastasis is also associated with many other cancers, such as pancreatic and colon cancers, our findings uncover a mechanism for TAM-mediated spheroid formation and provide a potential target for the treatment of ovarian cancer and other transcoelomic metastatic cancers. Macrophages are involved in spheroid formation in an orthotopic OC model. ID8 OCs stably expressing mCherry fluorescence protein were implanted into 8-week-old tomatoLysM-Cre recipient mice. Cherry+ tumor cells and GFP+ cells infiltrated into the peritoneal cavity were detected at 2, 4, 6, and 8 weeks after tumor cell implantation. (A) Peritoneal cells were smeared on slides and were observed under a fluorescence microscope. Representative images are shown. n = 5 mice for each time point. (B) The total number of GFP+ cells was quantified. Inset shows cell counting from days 0–20. n = 5 mice for each time point. (C) The total number of Cherry+ tumor cells was quantified. Inset shows cell counting from days 0–20. n = 5 mice for each time point. (D–G) Macrophage and spheroid formation. Representative fluorescence images from weeks 3 to 6 are shown in D. Total number of spheroids (spheroids/100 μl ascites) (E) and size of spheroids (number of cells/spheroid) (F) were quantified. n = 5 mice for each time point. Initiation of spheroid formation at week 3 is indicated. (G) Spheroids collected at week 8 were subjected to immunostaining with APC-conjugated (647 nm) anti-CD68 and DAPI, followed by confocal imaging. GFP+ and CD68+ macrophages, Cherry+ tumor cells, and DAPI for nuclear staining are shown. A merged image is shown on the right. All data are presented as mean ± SEM. n = 5. *P < 0.05; **P < 0.01; ***P < 0.001 (2-sided Student’s t test).